Order your Vater 5B Extended Play Hickory Drumsticks Pair from AMS and enjoy Fast & Free Shipping. Get the Best Deal with our Lowest Price Guarantee & Great Customer Service! Guaranteed increased durability and no breakage due to wear in the rimshot area. The Vater R&D Team introduces the Extended Play series, a new innovation in drumsticks. The Vater Extended Play Series is an extremely durable drumstick that has two distinct features; The first feature is a pearl-colored, specially formulated durable finish that protects the tip and shoulder area of the stick from early chipping and cracking. The second feature is our exclusive 3 inch “Stick Shield “located in the rimshot area that is highly impact resistant and 8X stronger than Steel with maximum tensile strength. The grip area of the stick has the same great-feeling finish as found on all Vater Sticks. Extended Play sticks offer the optimal balance and feel of a Vater hickory stick, with advanced durability and resistance to rimshot fatigue and breakage. 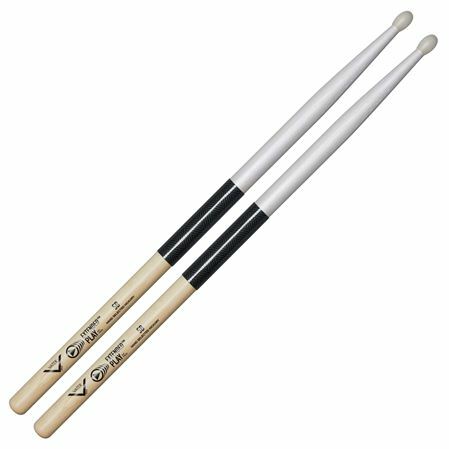 Phone: 781-767-1877 Warranty: Manufactured in the USA, Vater tone and weight matches their sticks by computer analysis to guarantee a straighter, higher quality drumsticks than other leading drumstick manufacturers.